Solar cell is the semiconductor device that converts light energy into electrical energy through the Photovoltaic effect. Solar cells are intended to capture energy from the sunlight while the term Photovoltaic cell is used to denote the devices that receive light from unspecified sources. Solar cells are connected in series to get Additive voltage. 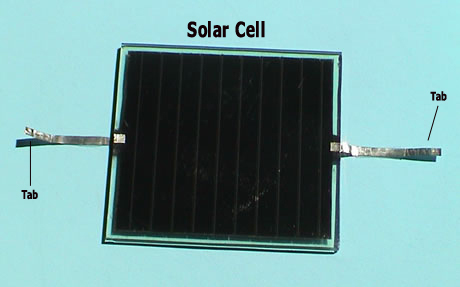 The serially connected solar cells are encapsulated as Modules which are then interconnected in series or parallel to get a large Array. Series connection increases the voltage while parallel connection increases the current. Each panel has specified voltage, current and power output which depends on the number of solar cells connected in series and parallel. Let us see some solar facts. Each solar cell has a large Silicon p-n junction which is made by diffusing the n type material into one side of the p type Wafer. In practice, if a p type material is placed in contact with n type material, electron diffusion occurs from the n type material in to the p type material due to the difference in the concentration of electrons. N type material has high concentration of electrons than the p type material. When this occurs, in the p-n junction the electrons combine with the holes of the p type material. The electric field thus creating in the p-n junction behaves like a Diode and allows the charge to flow .This is known as the Drift current. This Drift current opposes and balances the carrier flow and creates a Depletion region that contains no moving charge carriers. Solar energy is in the form of Photons and the solar cell absorbs the photons in its semiconductor material. The absorption of the photons occurs only if the photon energy is higher than the band gap energy of the silicon semi conductor. The electrons in the n material are in the valance band so they are tightly bound to neighboring atoms through covalent bonds. The photon energy excites these tightly bound electrons to turn into conduction band so that they can move freely in the semiconductor. The electrons are knocked out of the n material by the energy of the photon leading to the flow of electrons and electricity. Since the solar cell behaves like a diode, the current flow is in only one direction. The solar energy thus becomes the usable DC voltage. Some heat is also formed through lattice vibration called Phonons during this process. This is due to the difference in the photon energy and the band gap energy of the silicon. The charge carriers in the solar cells may be Drift carrier or Diffusion carrier. Drift carriers are produced by the electrostatic field across the solar cell while the Diffusion carriers are produced due to the gradient from the higher concentration of electrons to the lower concentration. This gradient is an electrochemical potential. The n and p type materials are connected using Ohmic metal semiconductor contacts. These are also used for the external connections. The electrons from the n material can pass through these contacts to the external load and returns to the p type material through the load and the connecting cable. Once the electrons return, they combine with the holes in the p type material. In a solar panel, the average output power is equal to 20% of peak power. Power output of solar panel depends on the number of solar cells connected in the array. Power of solar panel is measured in terms of Watts or Kilowatts. Watt hours or Kilowatt hours is also used depending on the load requirements. Where Pm is the maximum power point, E is the light irradiance and Ac the surface area. Efficiency and life span of the solar panel depends on the quality of its material and the manufacturing. A good quality solar panel can work up to 20 years if properly maintained. Direct sunlight on the surface of solar panel produces maximum current. Shades, cloudy sky, mounting angle etc can seriously affect the performance of solar panel. Power output of the solar panel depends on its make. 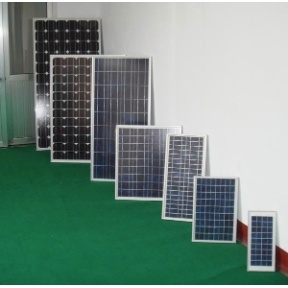 Solar panels are available as 3 volt DC, 6 VDC, 12 VDC 24 VDC etc. As a rule, a 15 watts solar panel can deliver 1 Ampere current per hour in bright and direct sunlight. It is very important to maintain the solar panel for its good performance. Periodic cleaning of the surface and external electrical contacts is necessary to remove dust, dirt, rust etc which can seriously reduce the power output. Cleaning once in a month is ideal. A simple White LED lamp can be constructed like this. It uses a 6 volt solar panel (2 or 5 Watts) and a 1 watt White LED. 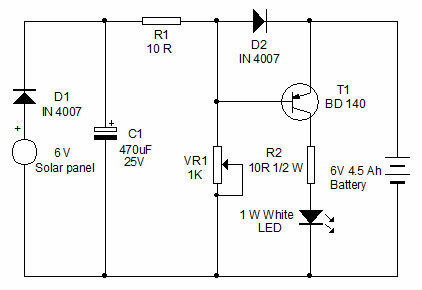 During day time, solar panel generates current and the battery charges via D1, R1 and D2.Open circuit voltage of 6 V solar panel is around 10 volts. At the same time the base of PNP transistor T1 gets bias through R1 and VR1 and it remains non conducting to keep the White LED off. In the evening, current from the solar panel ceases and D2 reverse biases. T1 turns on and LED lights. Use a 6 volt 4.5 Ah emergency lamp battery. White LED consumes around 100-300 mA current but it can give sufficient light equal to 8 watts CFL. 6 volt solar panel cost around Rs.300, White LED Rs.50 and Battery Rs.150. So at the cost of Rs.550, you can make this energy saving lamp. Since the sunlight is not uniform in all days, battery charging will not be perfect. So occasionally charge the battery using a 6 volt DC adapter to keep the battery in good condition. 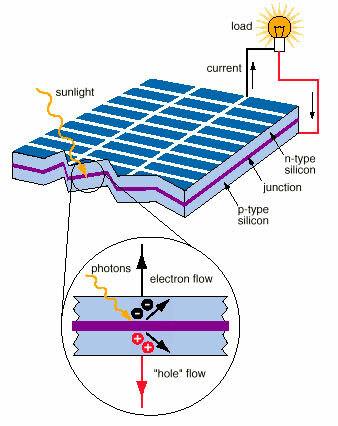 Next Fact File 1- How does Solar cell works? Duration of the light ??? Time it will take to drain out battery ??? 6 volt 10 watts – Rs.800, 12 volt 10 watts-Rs.1200, 12 volt 20 watts- Rs.1800, 6 volt 150 mA- Rs.300 etc. A 12 volt 10 watts panel gives around 1 Ampere current which sufficient to charge a 12 volt Lead Acid battery, if it is a new one.I am using the same panel for external lighting using a 100 VA inverter.Battery attains full charge in the evening. 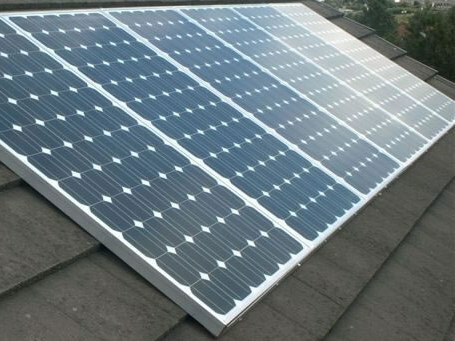 At the age when there is lots of power cut and power shortage, solar panals are the best alternatives. But how to get a solar panel? Kindly let us know where we can get panels and what it costs for running lights and fans for homes. We could work for self sufficiency so that we need not be dependent on the Govt. for power. Thanks for all the wonderful information. I am basically from Chennai where the power shortage is very high and fluctuation is also ranges from 140 to 180 V AC.